Rec Room is a free-to-play platform that allows friends to meet up, play a variety of games and create content together as customized avatars. Players can either meet up in open hang out spaces or play sports games like dodgeball together. You can even take on more elaborate games like co-op adventure quests, paintball, and Rec Room’s take on battle royale. Quest is due to launch this spring too, so it’s likely Rec Room will arrive alongside it. The headset costs $399 for a 64GB version but a 128GB device will arrive for $499 too. The post Against Gravity’s Rec Room Finally Confirmed For Oculus Quest appeared first on UploadVR. Stormland Looks Awesome in its Latest Trailer A specific release date has yet to be revealed. It seems like we’ll be learning about new games coming to Oculus Quest pretty regularly between now and launch. Today, Oculus confirmed that Vacation Simulator, Creed: Rise to Glory and many more games are coming to the standalone headset. The news was confirmed via a new sizzle reel for Quest, launched in time for PAX East this weekend. You can see it below. We see many of the games already confirmed for the device along with a raft of new titles. Vacation Simulator is the latest from Job Simulator developer Owlchemy Labs. It’s essentially a sequel to Job Sim though, as the name suggests, this time you’re causing havoc in holiday spots. It’s one of VR’s most hotly anticipated titles, building on the foundations of intuitive interaction that Job Simulator established. The game’s actually not out at all yet; the PC VR launch is on April 9th and the PSVR release follows on June 18th. Owlchemy says the Quest version is due this holiday season. Creed, on the other hand, has been available since last year. It’s the most recent game from Raw Data and Sprint Vector creator, Survios. As you’d probably guessed, it’s a boxing title that ties-into the new film series set in the Rocky universe. You play as Adonis Creed and rise through the ranks by boxing your way to victory. We love the game’s innovative controls and the excellent multiplayer, all of which should be a great fit on Quest. Elsewhere in the video we can see glimpses of Job Simulator, Rush, Keep Talking And Nobody Explodes, Ultra Wings, Elven Table Tennis and Fruit Ninja VR, all of which weren’t confirmed before. We also get a quick glimpse at anticipated ports of Robo Recall and Moss as well as what looks like the first gameplay footage of Star Wars: Vader Immortal. These reveals join last weeks announcements that Beat Saber, Journey of the Gods and Shadow Point are all coming to Quest. Both games should make for great additions to Quest’s growing library. Oculus says the headset will have 50 titles available at launch. The headset hits this spring for $399. There’s a 128 GB version as well for $499. Make sure and check our Oculus Quest landing page for even more new game confirmations! The post Oculus Quest Sizzle Reel Confirms Vacation Simulator, Creed And Many More appeared first on UploadVR. It was just last week we got a fresh look at Stormland, the new Oculus Rift S exclusive from Insomniac. But another new trailer arrives this week, just in time for PAX East. This trailer has a much bigger focus on story. We see what the game’s titular setting looked like before an event called ‘The Tempest’. We also learn that players are in search of ‘the others’, which likely refers to other defunct robots around the world. In the world of Stormland you too embody a robot that appears to have been left offline for many years. Once reactivated, you explore what remains of the world, upgrading your abilities by finding pieces of other robots. And, finally, we get some more action-packed gameplay clips. While last week’s hands-on mainly focused on exploration, this video reassures that Stormland offers plenty of first-person shooter (FPS) action. Visually the game is easily one of VR’s best-looking titles and our hands-on suggests it’ll be one of its deepest too. Gamers often call for VR to get full, long-form, AAA videogames and Stormland certainly looks like it could fit that bill. And, yes, Stormland will be playable at PAX East this weekend. Oculus is set to have a pretty big presence at the show, showcasing much of the content it revealed at GDC. Attendees will also get a chance to try out Asgard’s Wrath and Journey of the Gods. The game should be out later this year. It’ll support both Rift and Oculus’ shiny new PC VR headset, Rift S.
The post Insomniac’s Stormland Gets Story-Driven Trailer For PAX East appeared first on UploadVR. The post Hands-On: Dance Central VR Made Me Dance Like No One Was Watching appeared first on UploadVR. Ultra-Luxury Cruise Line Seabourn Trains Waitstaff Using VR Pixvana has provided the VR solution. The Finnish National Opera is Looking for Creators to Design an Immersive Arts Concept Submissions should be made by 15th April. The latest update to the Lenovo Mirage Solo adds a passthrough mode. The Mirage Solo is the first standalone Daydream headset, launched in May last year for $399. Daydream is Google’s Android-based VR platform. Passthrough refers to seeing the real world while inside a VR headset via cameras built into or mounted on it. The feature was first announced back in September, and has now finally shipped to users. The option can be found in the Beta section of the Settings, and is described as “Allow headset to use camera see-through mode for safety graphics and in experimental apps“. There are no “experimental apps” which seem to use the passthrough mode yet. The first VR headset to offer passthrough was the Samsung Gear VR. The phone’s rear camera could be activated from the settings, however its low field of view, lack of stereo and latency made it impractical. The HTC Vive in 2016 shipped with a similar kind of passthrough built into its Chaperone boundary system, so when you step near the edge it activates. Google’s new passthrough system is also activated by leaning out of the play area. But unlike earlier passthrough systems, Google uses the two cameras and computer vision to enable depth perception. Passthrough techniques are also expected on the upcoming Oculus Quest and Rift S headsets. Stereo-correct passthrough that activates when you move outside the play area is a great addition to VR, and could be an essential feature of all headsets in the future. Users who enable this on their Mirage Solo should be able to enjoy VR without worrying about situational awareness as much. Perhaps this is a stepping stone to a Mirage Solo successor from Google — a competitor to Facebook’s Oculus Quest? The post Lenovo Mirage Solo Update Adds Camera Passthrough To The Daydream Standalone appeared first on UploadVR. Five Nights at Freddy’s VR: Help Wanted Offers a Scary April for PlayStation VR and SteamVR It'll add new features to the original horror experience. 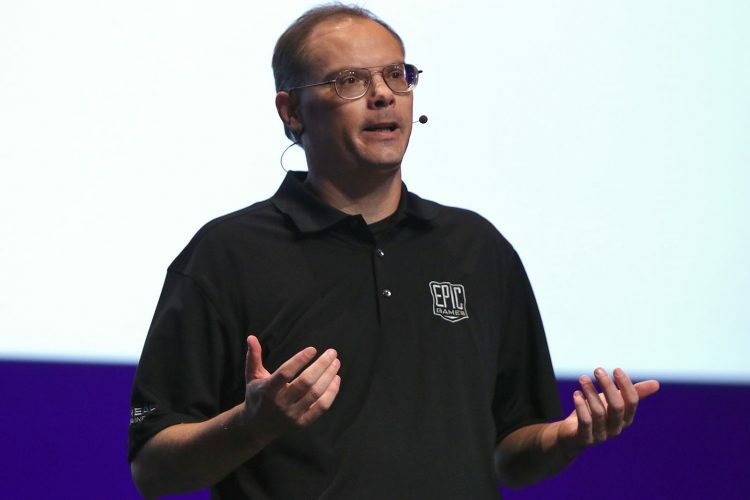 I spoke to Epic Games CEO Tim Sweeney at the Game Developers Conference last week. Sweeney declined a full interview but agreed to answer one question about the VR and AR market on the record. Sweeney is, of course, the CEO of the company behind Unreal Engine, Fortnite, Epic Games store and more. A team at Epic built Robo Recall for Oculus Rift and the company’s development tools are designed to support the OpenXR specification for cross-platform development. Beyond that, though, how Sweeney views opportunity in these markets could be helpful to developers. VR and AR will transform the future of entertainment and Epic is investing heavily in it. A lot of our investment is the enterprise side where customers all over the world are doing amazing things to visualize products and do virtual production on movie sets and other things like that. I think our recognition now is we’re still — despite a lot of early hopes — we’re still sort of in the Palm Pilot phases of this revolution rather than the smartphone era of the revolution. So we’re investing heavily but its…going to take years before it develops into a market that changes the world for everyone. But I do believe in this future of the world in which billions of people are wearing AR hardware, AR glasses are their everyday life and I believe that’s the entertainment platform of the future. And we’re gonna be there. And we’re very very happy to see Microsoft announce the HoloLens and all their future AR efforts will be treated as open platforms. I think that’s an incredibly important thing for the future of the industry. AR especially, you’re talking about hardware that’s going to present unparalleled visual fidelity — imagine 8K per eye filling your entire field of view — and imagine sensors constantly picking up your facial movement and the world around you to digitize it. We’re going to need very strong privacy protections and very strong guarantees of open platforms and open access to platforms so that we don’t end up in some sort of surveillance dystopia as you might see in science fiction. The post Epic Games CEO Tim Sweeney On AR: ‘We’re Going To Need Very Strong Privacy Protections’ appeared first on UploadVR. The post Enhance Your 360-Degree Video With Rich360 appeared first on VRScout. Beyond Medusa’s Gate is Ubisoft’s Second Location-Based VR Experience, Arriving May 2019 The VR escape room experience was developed by Ubisoft Blue Byte. Mike Ambinder, a psychologist and researcher at Valve, packed a room at the Game Developers Conference with a talk on whether you can control games directly with a brain-computer interface (BCI). Increasingly, game developers are asking whether a 17-button controller or a mouse/keyboard are the best possible interfaces for interacting with games — or if there is something more “naturalistic” that could improve the connection between what we want to do in a game and what actually happens. It may be the stuff of dreams, but Ambinder said many researchers are working on solving the problem today, and it’s hard to predict how soon someone will make a breakthrough. The whole point is to cut the middleman, in this case the game controller, between the intention of the player and the game simulation. Above: Mike Ambinder is the experimental psychologist at Valve. “In the long run, this will give us the most bang for the buck,” said Ambinder, in terms of directly wiring into our brains. For instance, we know there are both verbal and nonverbal parts of a conversation. The nonverbal includes the change in someone’s tone of voice, facial expressions, and where someone is facing. A mouse and keyboard has lots of different inputs that can be very precise, but they might be very hard for humans to remember them all. Gamepads can be simpler, but they still have all those buttons. There are also gesture controls — for things like swinging your arm and boxing. Those can be more intuitive, but they also make you tired. In the case of both controllers and keyboards, you have to think about a movement and translate it into a movement that triggers an interaction in a game. A new kind of controller might be able to help people play better, including those who are disabled in some way. Microsoft showed that with its Xbox Adaptive Controller for people with limited mobility. They could perhaps even help people see again who can’t see, Ambinder said. Maybe we could send data that bypasses the eyes and goes straight to the brain. Above: What’s the ideal game interface? The post Valve Psychologist Explores Controlling Games Directly With Your Brain appeared first on UploadVR. The post No Man’s Sky Crashes On To VR Headsets Later This Summer appeared first on VRScout. Bow to Blood: Last Captain Standing Sails onto Oculus Rift and HTC Vive Next Week The PlayStation VR version will also be updated.